Bank Holiday Sunday 03 May 2009! @ A Secret Venue (Licenced!) / London! More info please visit Click here (Coming Soon)! Main Stage : Hosted By : Antiworld! 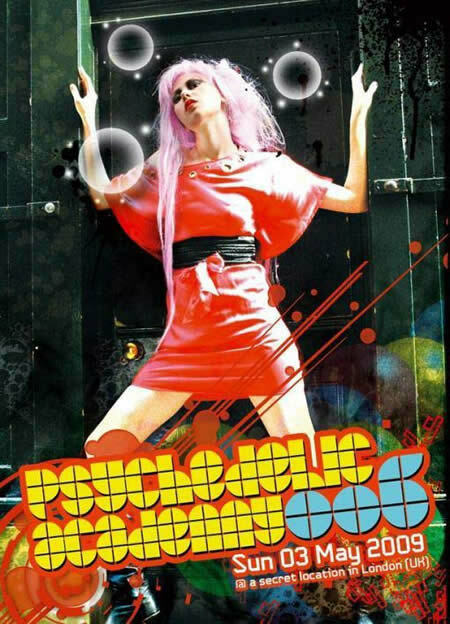 Music Style : Full On "Power" Psychedelic Trance! / "New Antiworld International Resident"
Psychedelic Academy 006 has a limited capacity of 1500 People who can come to the show so please get your tickets soon! Please Note That ONLY In The Office Or London Help 4 U There Will Be The Offer Buy 10 Tickets & Get One Free!!! Launch Party In October 2009 / Moskow! See You All @ Psychedelic Academy 006!!! Peace & Love and Happy 2009!! !